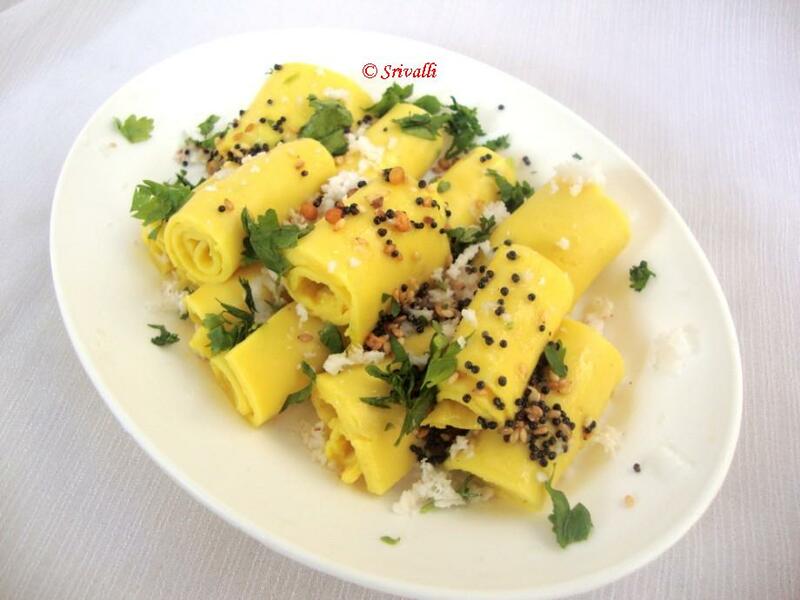 Spice your Life: Khandvi ~ A tempting Snack from Gujarat | | Indian Cooking Challenge for December | How to make Khandvi Step By Step Recipe! For Indian Cooking Challenge this month we are going to travel to Gujarat to taste another specialty dish from its fold, the Khandvi!. 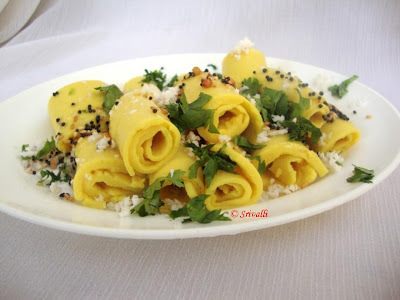 I remember being enchanted with Khandvi! 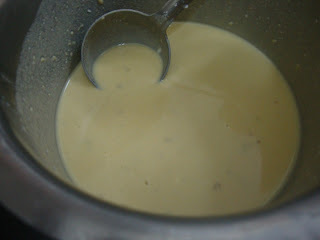 It has been since the days of those initial days of hosting Microwave Easy Cooking Event, when I got this entry. I was mesmerized with the look and how appealing it was all to see. 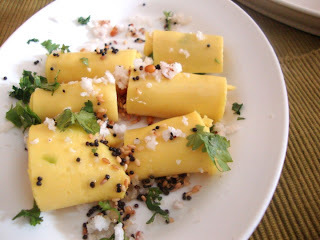 Then came the Dhoklas which again tempts one as nothing else does. 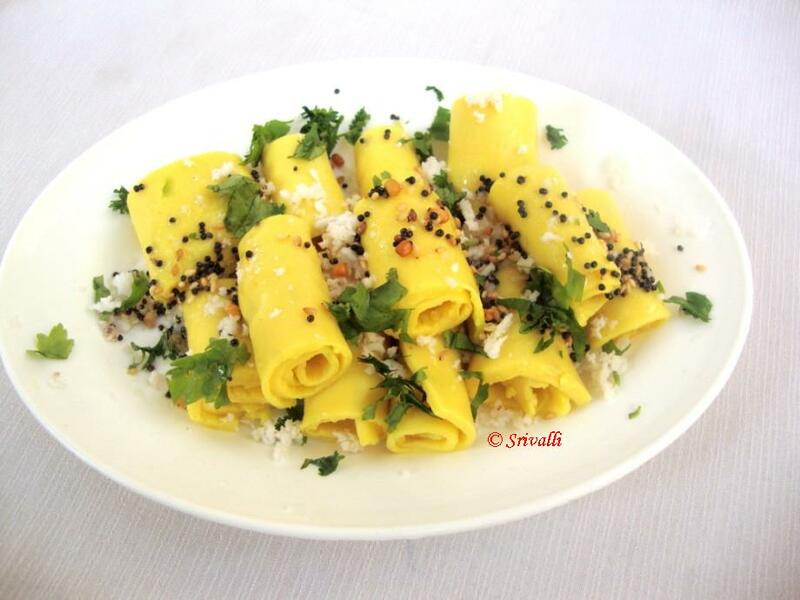 I was very keen on attempting at Khandvi for a long time. But every month somehow it gets missed. This time I again asked Lataji to get me a dish and she promptly presented me with two recipes for Khandvi, one that her friend shared it with her and another one from Anupama Krishnamurthy of Mitho Limdo. As always I am giving both the recipes, though I referred Lataji's . Keep a thali or a flat plate well greased ready before proceeding to cook. In a bowl, take the gram flour, salt, ginger-chilli paste, beaten curds and water and mix well. 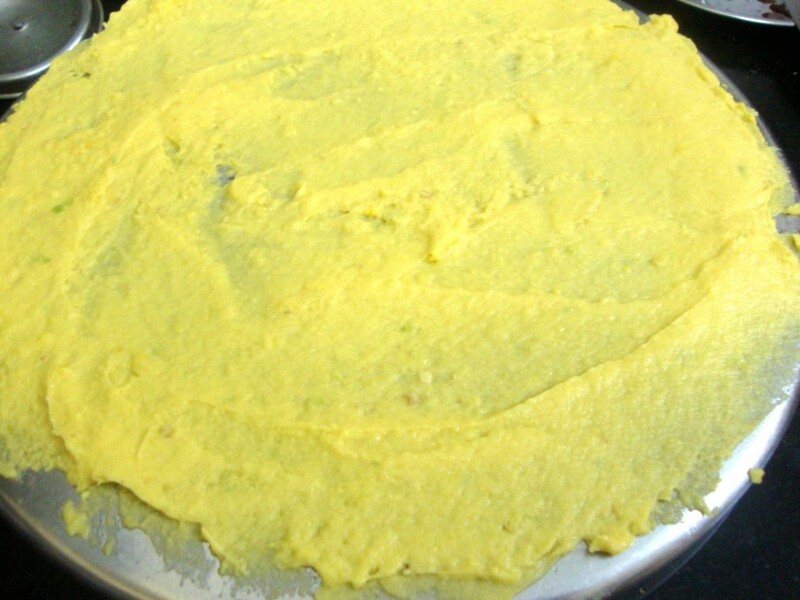 The batter should be of smooth thin batter, free of lumps. 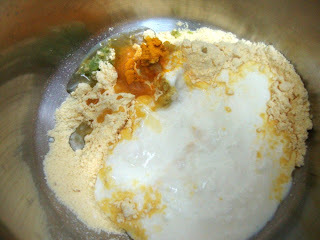 Add the sugar, asafetida and turmeric powders also at this stage. 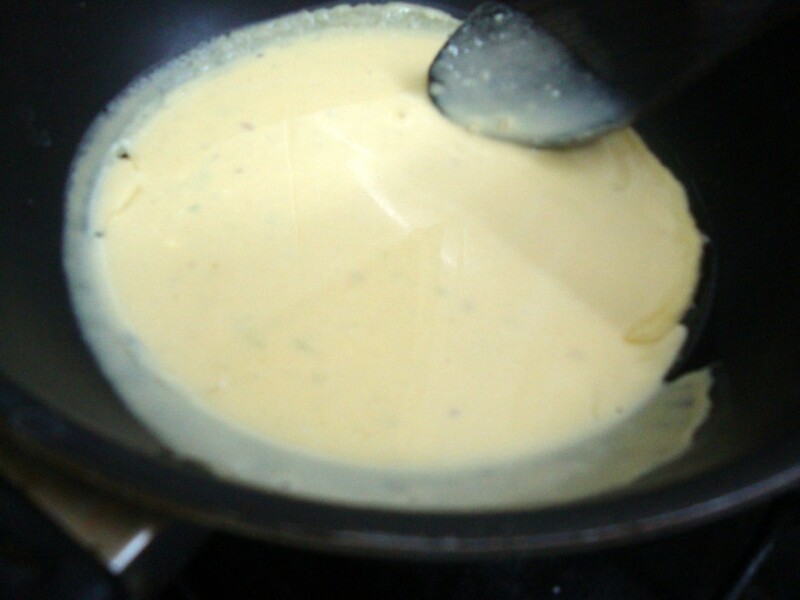 Heat oil in a thick bottom pan and add the prepared batter. 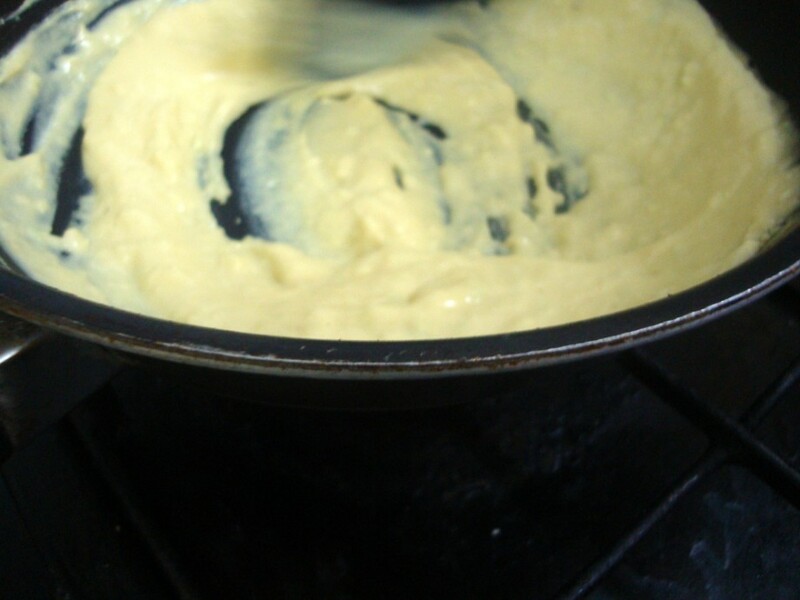 Cook the batter, stirring continuously until well cooked. 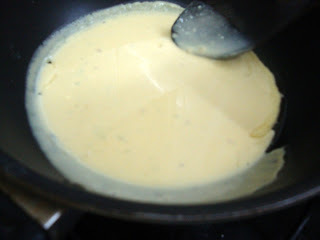 You can know it is cooked with the batter turns a light brown tinge, glaze from the oil and will not stick to the walls of the pan. 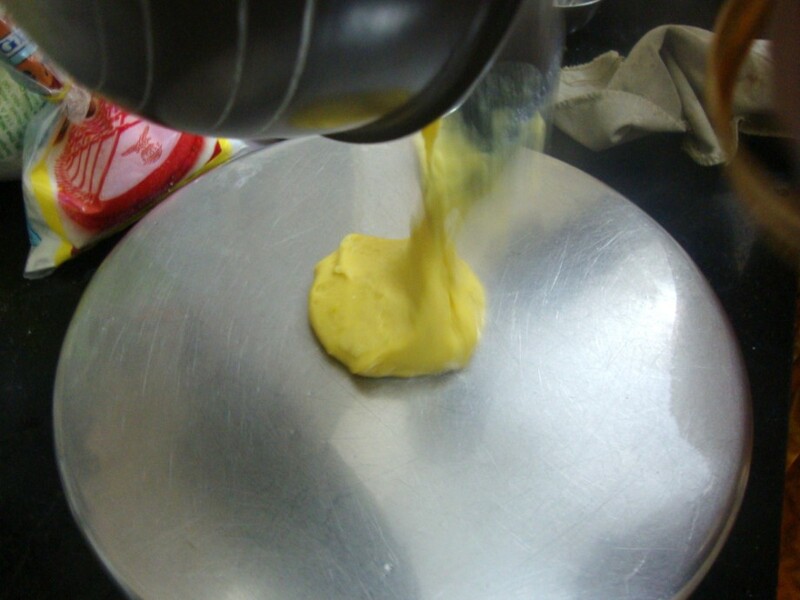 The batter should still be in a semi liquid state, tipping more towards solid state. Over cooking will result in a mass that will not spread evenly. 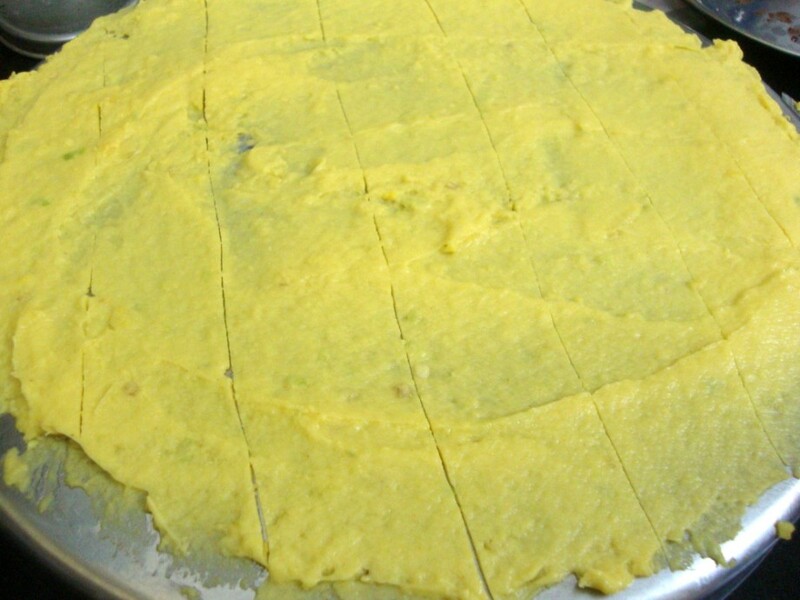 Transfer the cooked batter quickly on to the flat greased plate and with the ladle spread the batter to a thin sheet over the surface. This has to be done very fast as the batter will thicken as it cools and become difficult to spread. Using a knife make strips of this sheet. Roll each strip into spirals. Place them in a separate dish. 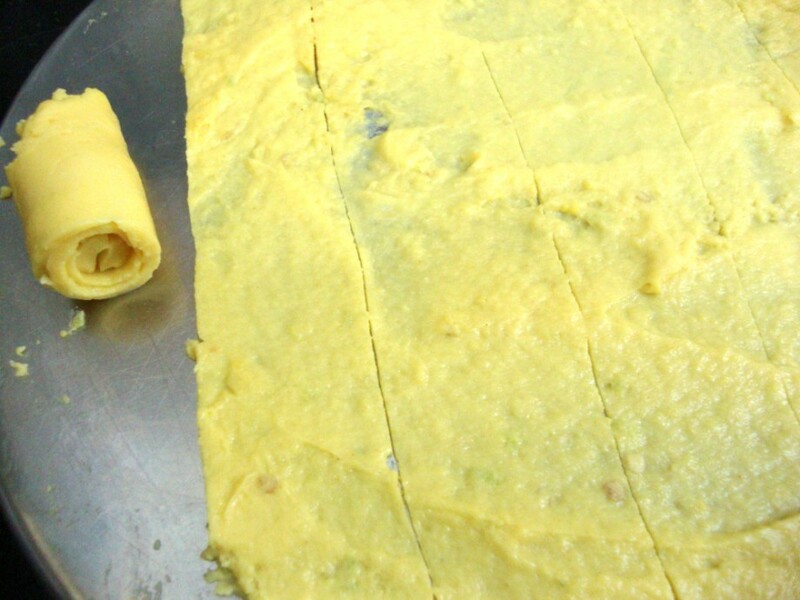 If the batter has been cooked evenly and correctly, the strips will easily roll and not crack in the middle. 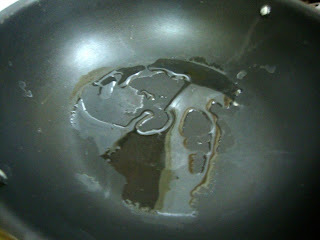 Heat another pan with oil, Splutter mustard and sesame seeds. 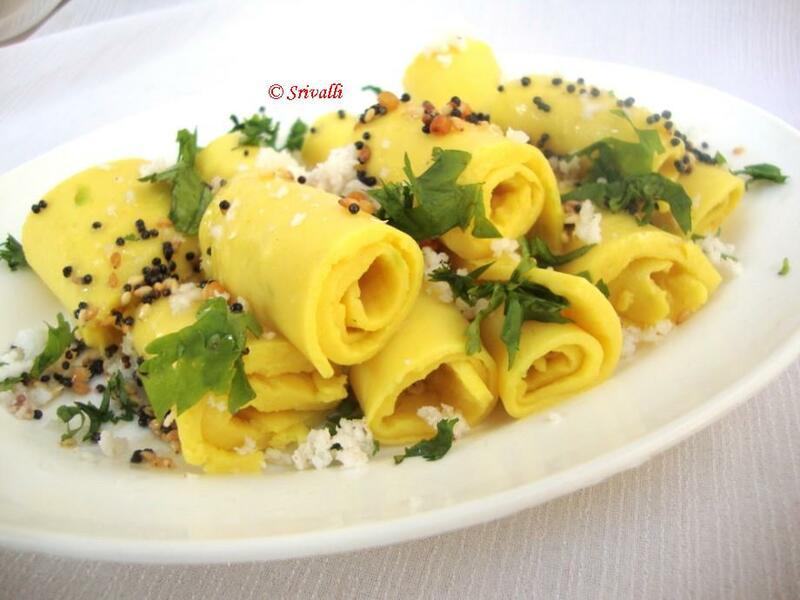 When they crackle pour them over the rolled khandvis. 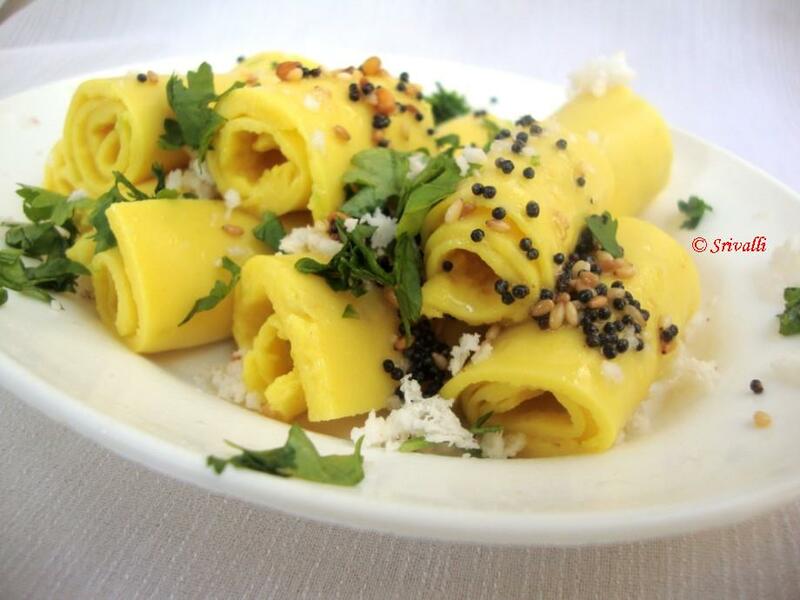 Garnish with a generous sprinkling of fresh, grated coconut and chopped coriander leaves. When the batter is almost ready to be spread, it might coagulates in tiny masses. Allow this to cool just about manageably warm. 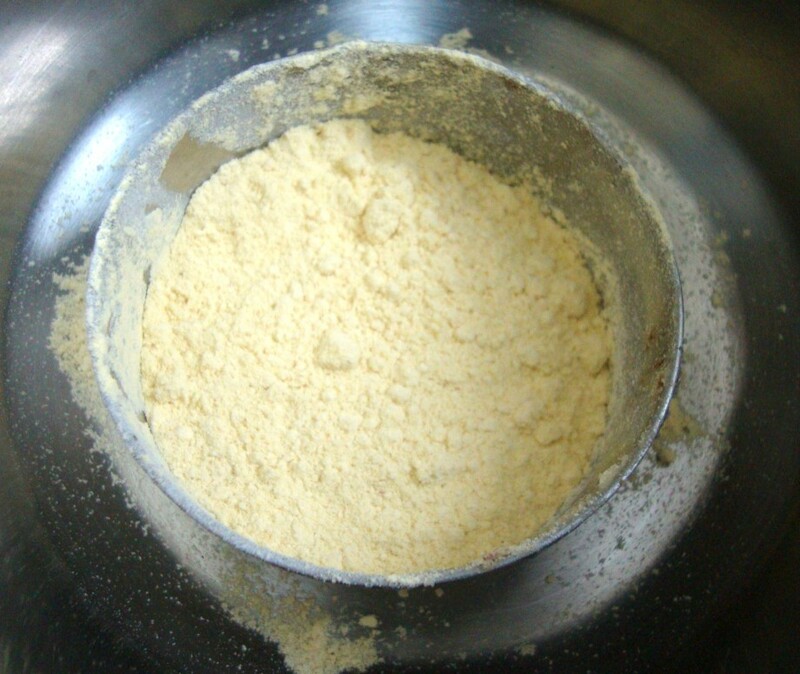 Too much cooling will thicken the mass and render it become unable to roll. Anupama explains that making Khandvi involves 5 steps - Mixing, cooking, spreading, rolling and Tempering (vaghar). She advises to have a clean and dry surface to spread the batter ready before we even attempt at making. Kitchen counter with granite will work perfectly, or else you can use a greased thali plate. Please refer Anumpa's notes for the method. Add abt 3/4 cup of water and mix well. Beat till you get a liquid like this. 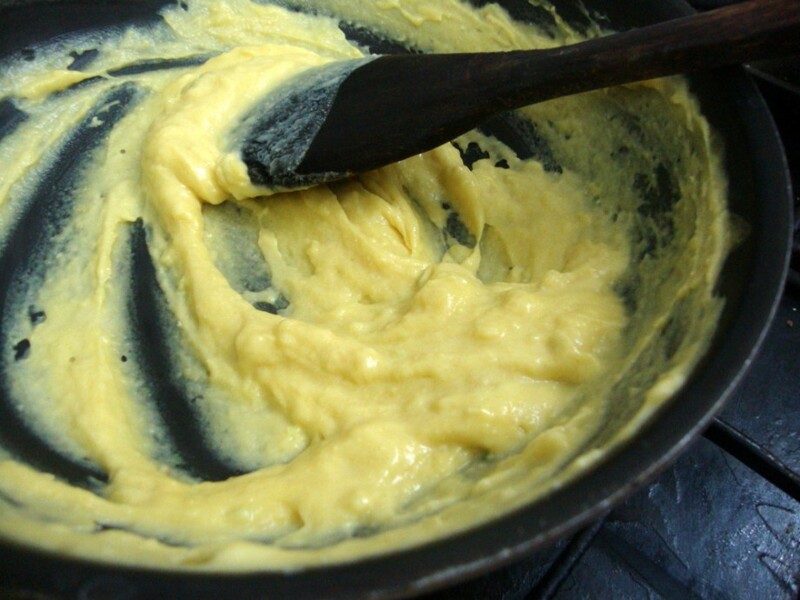 On a medium flame, pour the batter to the pan. Keep a big plate greased with oil ready, pour the batter over it. 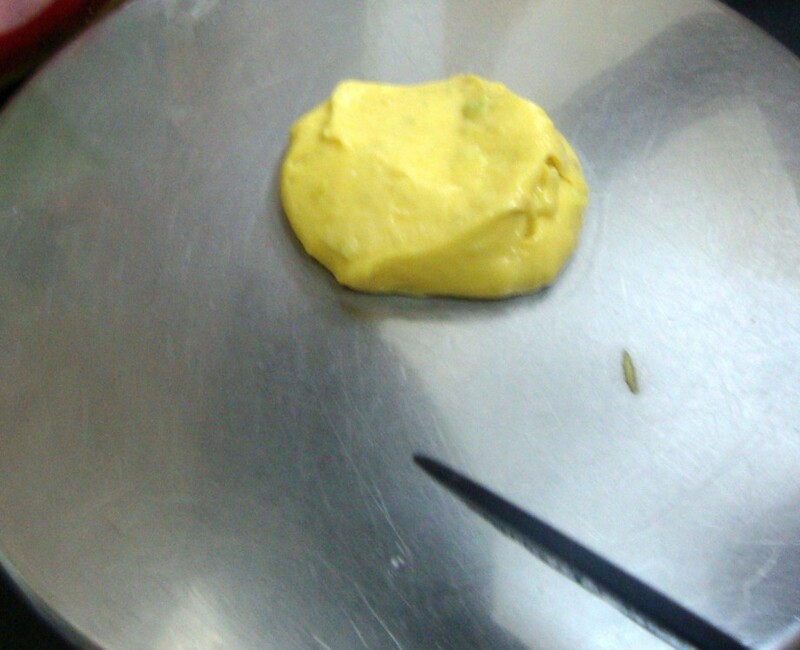 Using a greased ladle immediately spread it evenly. Allow it to cool for 5 minutes, before making marks with knife vetically like above. From one side, roll forward. 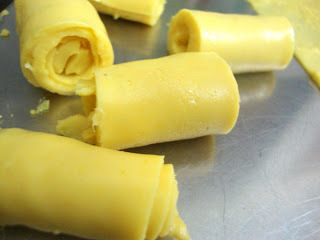 Continue rolling till you get roll like this. 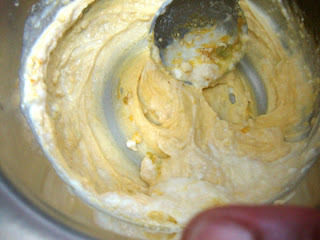 In another pan heat oil, splutter mustard, sesame seeds, pour over the rolls. 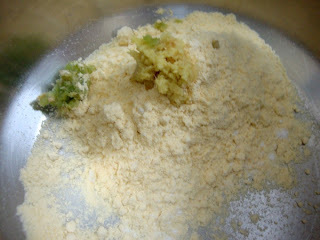 Finally add the grated coconut, coriander leaves. To all my ICC members, please link your Khandvi post to Mr. Linky.